This is the title of an excellent book by Mark Mazower , first published in 1998, which I have just finished. 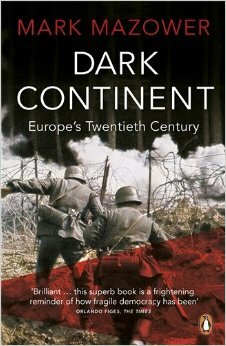 + Why did democracy, triumphant in the immediate aftermath of the First World War, become almost extinct across much of continental Europe in the following 20 years? + Was the League of Nations policy to protect national minorities doomed to failure and was the alternative policy of ethnic cleansing, practised at the end of the Second World War, thus inevitable? Even to this day, European countries have not devised a good way of creating a sense of belonging among national and religious minorities? In some European countries, minorities now make up a disproportionate share of the prison population. Sport seems to be one of the few ways in which minorities are integrated. + Why did the leaders of Britain and France assume that Hitler could be appeased with territorial concessions, when “Mein Kampf” had suggested his ambitions were much greater? + Why was the Soviet model so effective in the period from 1930 to 1950, in industrialising Russia and enabling it to defeat Nazi Germany, so ineffective afterwards in meeting the consumer aspirations of its citizens? Mazower says Stalinism was a “bad idea, implemented surprisingly well”. Communism collapsed later on, because Communist Party members had ceased to believe in it, and Russia itself had become tired of subsidizing its East European satellites to the extent of 2% of Russian GDP through artificially cheap energy. + Why did Hitler make the mistake of killing so many people (including 3 million Soviet POWs) who could instead have been put to work in his labour starved armaments industries? + What accounts for the surge in marriage and child births in the aftermath of the Second World War, and for the unsustainable decline in birth rates in more recent times? As the author puts it, “marriage has become a choice rather than a duty”. + Why did European countries diverge so much in the way they developed their welfare systems after the Second World War? The UK opted for a minimum income guarantee financed by taxes, whereas most continental countries opted for pay related systems, whereby better off people paid bigger contributions to the state, but got bigger pensions on retirement. The result is that in many continental countries the biggest beneficiaries of “welfare” systems are the better off. + What will become of nation states, when so many of the important decisions have, in practical terms, to be takes at a multinational or supranational level? As the author puts it “nation states are becoming mere shells, with no real hold over policy, while alienation from government has increased”. Mazower says the real victor in 1989 at the fall of Communism was “not democracy but capitalism”. But the problem we now face, as Europe tries to manage financial and banking issues, is that “capitalism does not create feelings of belonging capable of rivalling the sense of allegiance felt by most people to the state in which they live”. European Electorates continue to see all problems within a national framework, even though many modern problems cannot be solved in that framework.